'Tis the season to be jolly, no matter how you wish to celebrate the holidays this year. 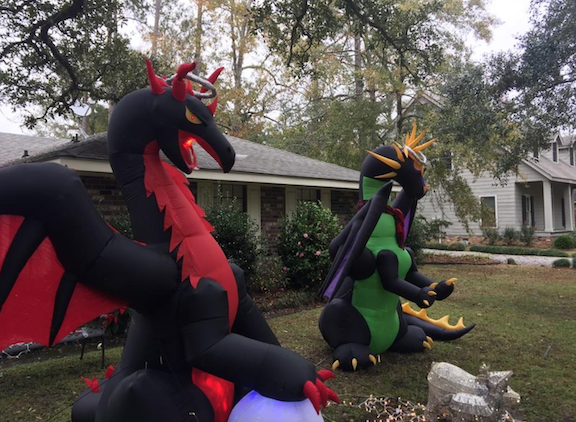 Diana Rowland, a former cop and morgue tech turned fantasy author, plastered inflatable dragons along her lawn to express her festive spirit to the rest of her southern Louisiana neighborhood. But her neighbors weren't impressed. 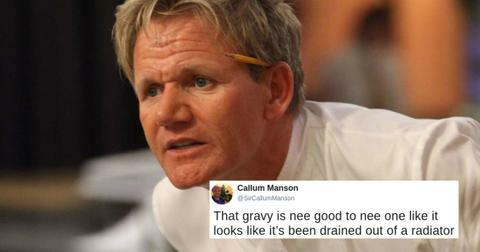 She recently posted a tweet that garnered over 35,000 likes and has nearly 10,000 shares, detailing a spat that took place the way most passive-aggressive feuds do: through typed communications in all caps. "Apparently the 'true meaning of Christmas' involves judgmental bulls--t?" Diana tweeted in response. And dragon lovers all around the internet are rallying behind Diana in her defense. After all, we've all seen our fair share of holiday decorations that are questionable at the very best. Case in point: As I sit here typing, my neighbor's inflatable elephant with Santa riding on its back is towering over me from two houses over. But do you see me creating a Word doc, printing it out, and leaving notes under their doormats like some bonafide loser? No thanks, I'd prefer to hang on to my dignity and not risk going viral as a hater on social media. However, it does raise questions about the family I share a block with. Like, do they work at Disney and did they have to fight their coworkers to secure this humungous eyesore, which, I can only guess, was once an unusable film prop? Or do they hold some deeper beliefs about Santa Claus that can only be expressed through elephant imagery? My curiosity runneth over. 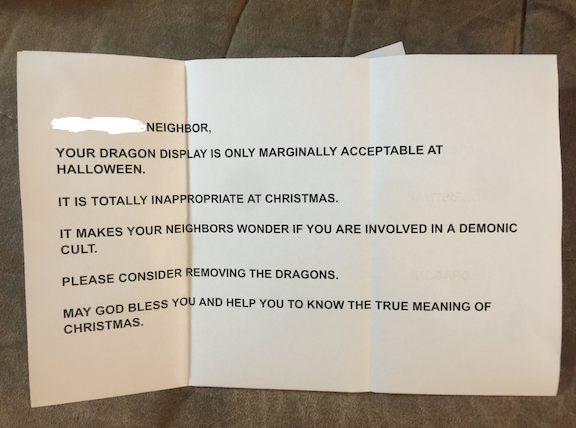 According to the note her neighbors left Diana, the dragon display "makes your neighbors wonder if you're involved in a demonic cult." They probably thought her dragons bore a resemblance to Baphomet, and are totally missing the point of the Satanic Temple's goat-man deity. "Please consider removing the dragons," the letter pled. "May God bless you and help you to know the true meaning of Christmas," it ends. What condescension from a family who's probably never missed a Midnight Mass in their life. Thankfully Diana, with the support of her family and new internet friends, had the perfect response to these trolls trying to rob her of her holiday joy. 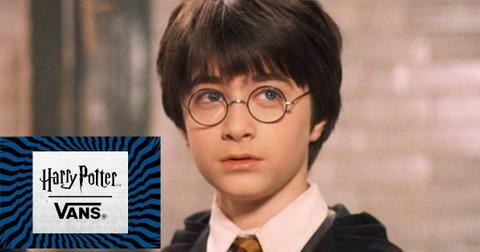 "I'm also rather baffled as to how the dragons are only marginally acceptable at Halloween. I guess they think I need MORE dragons??" she humorously wrote on Twitter. Her followers clamored along in support, writing, "this calls for more dragons" and "I think a gofundme should be set up so that we can chip in to help you delight your neighbor with more and more dragons." She updated to say that she had "literally just ordered another one for pickup tomorrow," but until it arrived, was just trying to appease her neighbors in the best way she knew how: by adding angelic halos to her blow-up creatures. She even looked up Bible passages to school her goody-two-shoes neighbors with. 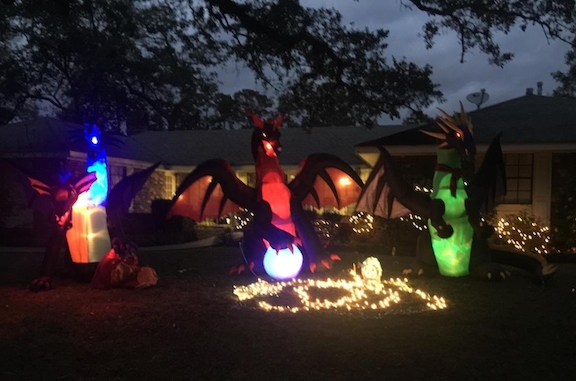 "In the spirit of neighborhood harmony, I have placed halos on the dragons. They are now angels. Ezekial 1:1-28. 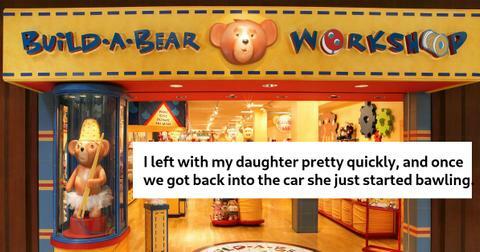 I'll fight anyone who says different," she captioned the photo above on Facebook. Before long, the new additions to her dragon clan arrived at her doorstep, and she threw Christmas hats on all of them to better appease her neighbors. "I am proud to present the new and improved and ultra-christmasified holiday display! (h/t to my sister for providing the two christmas dragons! )," she shared on Facebook. And people all around the web were wondering how they could help her further her cause. 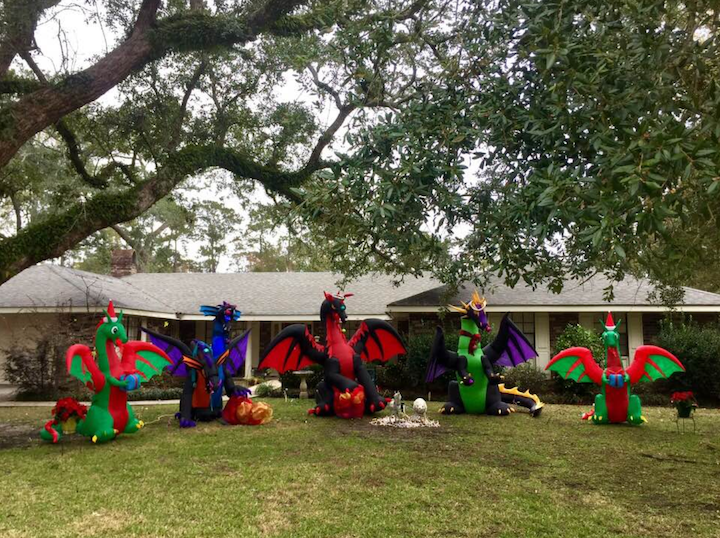 After receiving dozens of messages offering financial support to basically render her entire street invisible by way of countless inflatable dragons, she tweeted, "TBH, I'm flush enough at the moment to afford my own dragons ... and am instead asking people to donate to the charity of their choice in honor of MY DRAGON ARMY. Because my dragons share their hoard w/ those in need." At least one person so far has taken her call-to-action to heart and donated to a penguin conservation charity. Diana's inbox was so flooded, she had to reiterate her donation request: "Hi, everyone! I've been getting a lot of messages about fundraisers/collections to buy me MORE DRAGONS, but I would much rather any Dragon Army money be donated to a worthy charity of your choice. Let's make this holiday season about joy and charity for all. Thanks!!" And then she had to do it once again. "To clarify. Please don't send me money. :-)," she tweeted. I wish I had followers lining up to offer me and my imaginary dragons some financial support. But many others online are taking this opportunity to share their own amazing dragon decorations with Diana, who clearly appreciates them. Am I the only one who didn't know Christmas dragons were a thing? 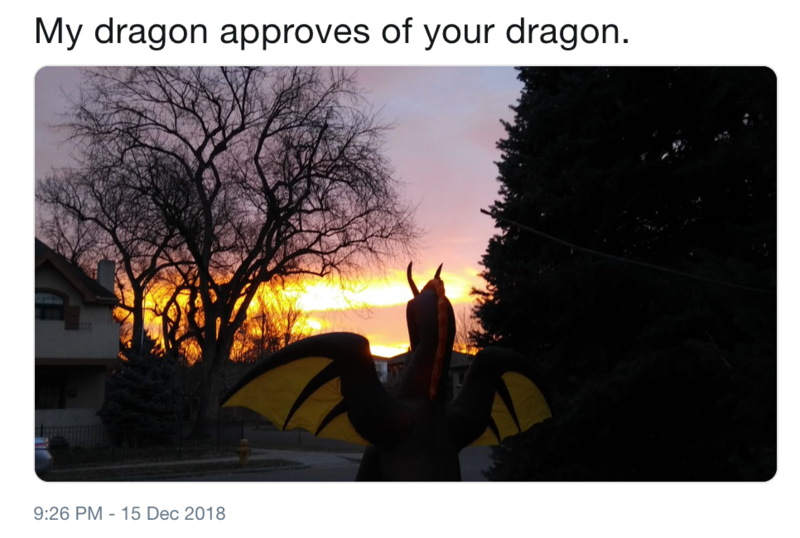 "My dragon approves of your dragon," wrote one woman in solidarity. Meanwhile, others couldn't wait to join in on the insanity. "Where are y'all getting these dragons?" tweeted someone in response. "They're so fun!" It looks like what began as Diana's neighborly quarrel turned into an act that has spread joy (laughs and retweets) and kindness (to penguins). Circling back to her neighbor's grinch's note, isn't that, in fact, the true meaning of Christmas?